Beautifully engraved SCARCE certificate from the MP3.com. This historic document was printed by the Security-Columbian Banknote Company and has an ornate border around it with a vignette of the company logo. This item has the printed signatures of the Company’s Chairman and Secretary. 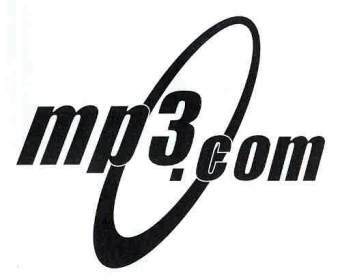 On Aug. 29, 2001, Vivendi Universal successfully completed the acquisition of San Diego-based MP3.com, Inc. in a combined cash and stock transaction. We have seen very few of these certificates. MP3.com, Inc. is home to one of the largest collections of digital music on the Internet. A favorite of music fans and emerging Artists alike, MP3.com features streaming and downloadable music from more than 200,000 Artists and over 1.2 million songs. Additionally, the company provides a wide range of unique products and services including music personalization, comprehensive genre and Artist charts, the Premium Artist Service (PAS) to showcase and promote Artists, and customized B2B services such as audio hosting and music licensing. MP3.com is headquartered in San Diego and is part of Vivendi Universal Net USA, Vivendi Universal's U.S.-based Internet and technology unit. 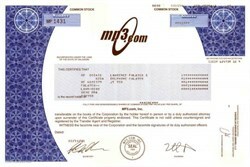 July 20, 1999 - MP3.com, Inc. (http://www.mp3.com) today announced its initial public offering of 12,300,000 shares of Common Stock at a price of $28.00 per share. Credit Suisse First Boston Corporation acted as lead manager, Hambrecht & Quist LLC acted as co-lead manager and BancBoston Robertson Stephens Inc. and Charles Schwab & Co., Inc. acted as co-managers for the underwriters. MP3.com has granted to the underwriters a 30-day option to purchase up to 1,350,000 shares of common stock to cover over-allotments, if any. MP3.com, Inc. (http://www.mp3.com) is pioneering a revolutionary approach to the promotion and distribution of music. The Company's Web site has grown into a premier online music destination. The Company uses the Internet and file formats that make music files smaller to enable a growing number of artists to broadly distribute and promote their music and to enable consumers to conveniently access this expanding music catalogue. The Company's Web site contains over 100,000 songs from over 18,000 artists, representing what the Company believes to be one of the largest collections of digital music available on the Internet. Consumers can search, sample and download music free of charge.